Missouri truly lived up to its nickname as the “Show Me State” on Tuesday when Gov. 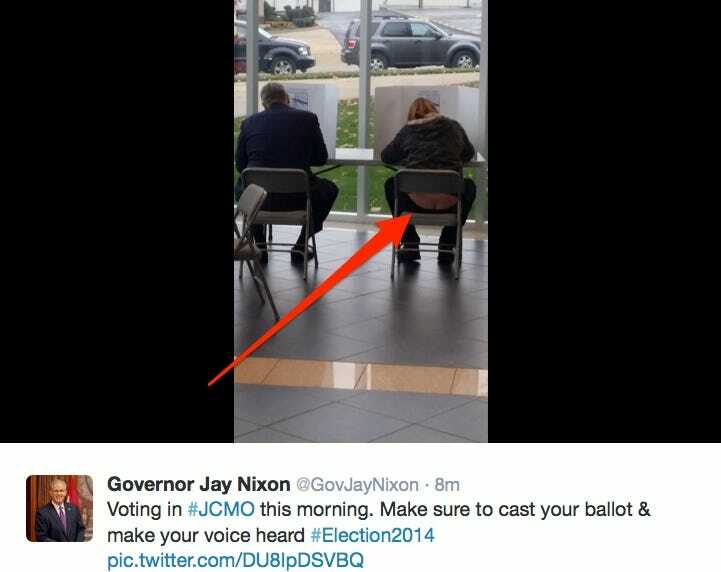 Jay Nixon tweeted a rather lewd photo in an effort to promote voter turnout. The picture showed Nixon filling out his ballot alongside a woman whose pants were apparently falling down exposing much of her backside. On Twitter, the image was condensed on the site’s main feed for users who did not click through to see the post leaving a magnified version of the image that focused on the woman’s backside. Nixon deleted the message shortly after posting it. His press secretary did not immediately respond to a message from Business Insider asking about the tweet. Business Insider added the arrow shown in this post.